This competition has now closed and the winner has been notified. Welcome to Day 5 of the MotherGeek Advent Giveaway! Today’s prizes are an ELC Happyland London Bus Set and a Qwirkle Board Game. The Happyland London Bus is suitable for children aged 18 Months and over. The bus is open top, and the top deck lifts out to give you (or the kids) access to the lower deck of the bus. 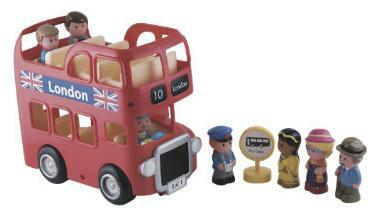 The Happyland London Bus set includes 7 characters, the bus and a bus stop. The lower deck has a traditional rear opening, to allow the passengers to get on and off the bus. The bus features fun noises, and requires 4x AA Batteries. (not included). Happyland London Bus has an RRP of £20, but ELC have a 25% off discount code at the moment, so it is available for just £15, delivered! Qwirkle is very similar to Dominoes, except you have to match pieces up by colour or shape, not numbers. The game is made up of 108 wooden tiles, featuring six shapes in six colours. Using the tiles, players aim to score the most points by building lines. Each touching tile must match it’s neighbour by either colour or shape. Qwirkle is a quick game to learn, but you’ll have to think strategically if you want to win. It is suitable for 2-4 players, aged 6+ and has an RRP of £20. The pack includes: 108 wooden tiles, 1 bag, 1 rule book. Remember, the blog comment post is MANDATORY. The other entry methods will increase your chances of winning, but are only valid if you have left a blog comment. Don’t forget to check back every day until Christmas! I am giving away a different prize each day, and the more days you enter, the greater your chance of scooping the JACKPOT PRIZE on Christmas Eve! There’s still LOTS of amazing prizes up for grabs, including a £50 Crave Maternity Voucher, , Mothercare Baby Bouncer, and MUCH MORE! Finally, I am aware that rafflecopter doesn’t display correctly via iPhones – unfortunately this is out of my control. It will work via tablets and computers, but doesn’t seem to like Mobile Versions.